There are millions of users who own an Android phone or tablet. If you were new to Android, then it will be hard to get started with the device as new features are consistently added. In nowadays, managing Android is not an easy task at all. The good news is that there are a few amazing software and apps out there, which dramatically ease the lift of digital life. In this article, I will review three popular and powerful Android Management software and you can choose one accordingly. Samsung is the top Android brand in the market and no doubt, their official synchronizing software is one of the best phone manager software that you can find. If you own an Android phone with Samsung brand, you can use the Samsung Kies program on the PC to manage the phone more efficiently, such as data backup, restore from backup or transfer content between two phones. Once connected your Samsung smartphone with PC via USB, it will be recognized by the program and at this point, you can perform various operations such as transfer photos, videos, music, contacts, etc. between mobile and PC. Samsung Kies also allows you to update firmware version of your Samsung device. There is also a function of "Backup & Restore" to secure all data. However, sometimes Samsung Kies does not recognize the connected mobile phone or does not allow you to make all the desired operations, in which case you will want to look for Kies alternatives, then rest of the two software for not only for Samsung devices. You can use them to manage any smartphone. MobileGo is the first choice for those looking for software to manage the contents of Android device directly from your computer. 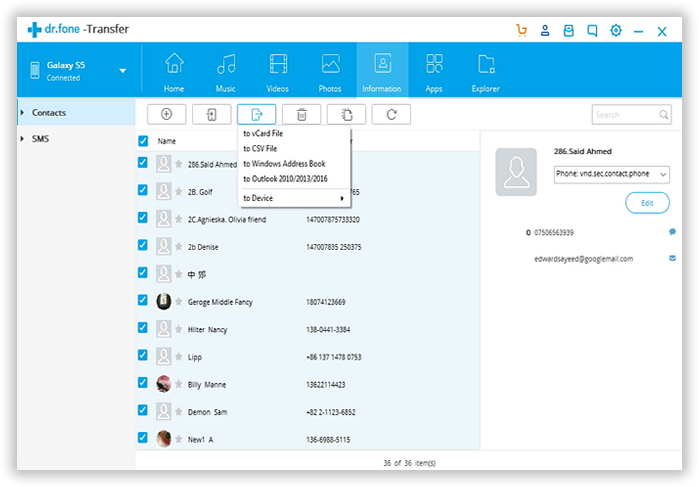 This program allows you to import and export photos, videos, contacts, messages, documents, etc... It also allows you to send SMS directly from your computer or backup and restore Android with a single click. MobileGo can be downloaded in both Windows and Mac version. It can connect to the Android device via USB cable or via Wi-Fi (for Windows version only). In addition to file transfer capabilities, it contains another two interesting features: install and uninstall apps directly from your computer. Music & Video Downloads lets you download mp3 music and videos directly on the device. TunesGo is a program available for both iOS and Android users. Whether you are a user of Windows or Mac, TunesGo allows you to manage all your smartphone and tablet data directly from your computer. 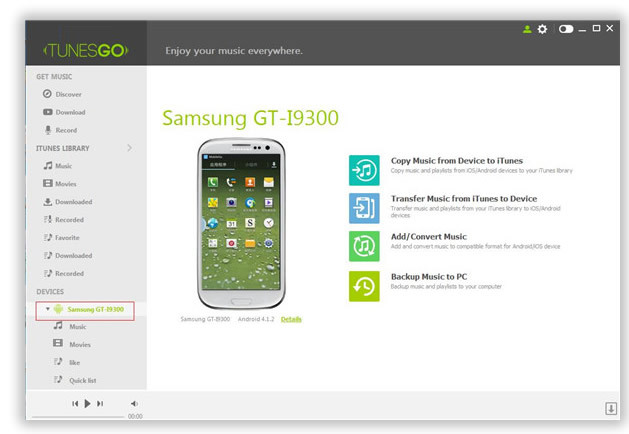 TunesGo supports more than 3000 models of Android devices of any brand and version. And it is very simple to use. 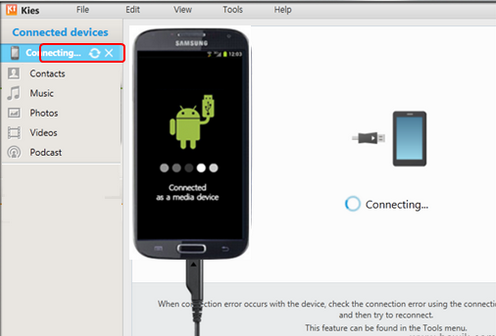 Once installed TunesGo on the PC or Mac, then connected your Android device via USB cable. You can see from above the use of the software, it is very intuitive. Once you accessed to the category, you can do multiple operations as an import new files from the computer to, export data from Android to your computer, delete files, etc. With TunesGo, you can manage photos, videos, music, contacts, text messages, and all data on the SD card of your Android. In the end, the three phone manager software that we have highlighted in this article is the best software to manage your device data from the computer. We don't want you to just read this article, but try yourself to know their advantages and please comment below if you find any more interesting phone transfer software yourself.